Portal's Role-Based Access Control (RBAC) model controls the access to features on the portal. For example, you can enable controls to allow registered user to create forum posts, use test consoles, and so on. This version of this document has details specific to version 4.18.05. Any references that are specific to previous versions are oversights and should be reported as bugs. For more information, see What is a developer portal? Do not install the portal on the same servers as Apigee Edge. 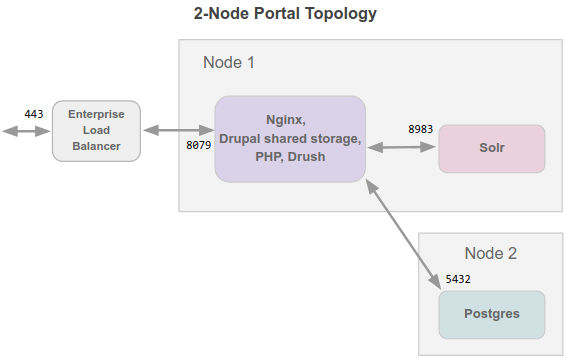 1 node: All portal components (Drupal, Nginx, PHP, Soir) installed on a single machine with Postgres. These topologies are the only topologies supported by Apigee. If you use a different network topology, Apigee might not be able to support it. Contact your account manager or Apigee Support if you require a custom solution. On a new install of 4.18.05, the installation script installs Postgres and Nginx. On an update to 4.18.05 from an install that uses Postgres and Nginx, the installation script updates Postgres and Nginx. On an update to 4.18.05 from an install that uses MySQL/MariaDB/Apache, you must first convert your installation to Postgres/Nginx before you can update to 4.18.05. For more information, see Convert a tar-based portal to an RPM-based portal. The database used by Drupal for new installations of 4.18.05. If you want to connect to a remote Postgres installation, it must be version 9.6. Apigee, but it is not enabled by default. Only enable it if you have a large amount of data on the portal. See Install the portal for instructions on enabling it.